There is never a shortage of interesting tales in Texas. They say everything is bigger in Texas and I’m assuming that includes tales. I certainly heard a lot of them at the cowboy (real cowboys wear their hats during the ceremony) wedding I did Saturday. But then again they all knew I was from California and sure to believe anything I heard! At the very least, they knew I wouldn’t know the difference. It was great fun. So, the mysterious objects nailed to the fence? Steer heads? Armadillos (I particularly liked that one!)? Catfish heads? The answer is catfish heads. Personally, I think that’s totally disgusting. After all, catfish are bottom feeders, trolling the river bed and lake bottoms where everything settles. I love fish, but don’t eat filtering systems of other animals. I consider catfish to be the filtering system of water ecosystems, along with algae and pond scum. I don’t eat organ tissues from other animals either, for the same reason. 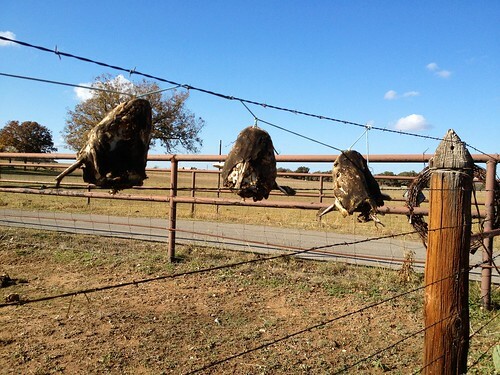 Besides finding out the real reasons catfish heads are on fence posts, someone tried to tell me that by putting the catfish heads on fences in front of houses, it kept the flies away from the front door! I didn’t fall for that one. Most said that catfish heads, and the bigger the better, were put on the fences as bragging rights. This served as validation that they really did catch a fish that big, verified by the size of its head. The other reason was you had to nail the head to a fence in order to clean it. Now I do believe that. My mother has a special catfish cleaning board that she nails the disgusting sucker to in order to clean it. She also uses pliers. I know for a fact those pliers get used for other purposes and am glad I have my own pliers and would never have to borrow hers! When I asked if any of them noodled, they looked at me like I really had lost it. It was fun telling them of this fine fish catching sport and encouraging them to try it if they really wanted bragging rights. I did keep my personal opinions of catfish as one of Texas’ finest white foods to myself. I didn’t want to ruin the possibility of getting called for future weddings and services. I could probably do a whole blog post on Texas white foods (white as in color of food, not race). Fried is just another version of white food. Someone asked me if I had seen snakes nailed to fences yet. I thanked him for putting that horrible visual into my head! I hate reptiles and rodents! Reptiles were the main reason I didn’t even consider the mission field! Well, enough tales for today. Thanks to everyone who participated in our yard art discovery!